Designer Sheila Rich painted the new drywall and moldings on the color-block walls in this Monmouth Beach living room the same because contrasting colors would have made them look shorter. Artwork by the wife pops, and motorized window treatments, with see-through sections revealing the Atlantic Ocean, stack when raised. The island houses a wine refrigerator and microwave drawer. Rich raised the counter to add more separation from the hallway and to hide clutter. White, black and silver tones dominate in the new kitchen. Puffy backsplash tile laid in a herringbone pattern adds texture; the countertops are matte granite with a leather finish. The huge support column, which designer Sheila Rich calls the “biggest design challenge of the project,” has LED lighting at the top to show off the homeowners’ collectibles. Rich installed the curvy soffit that “echoes the kitchen island and adds fluidity” to the space. 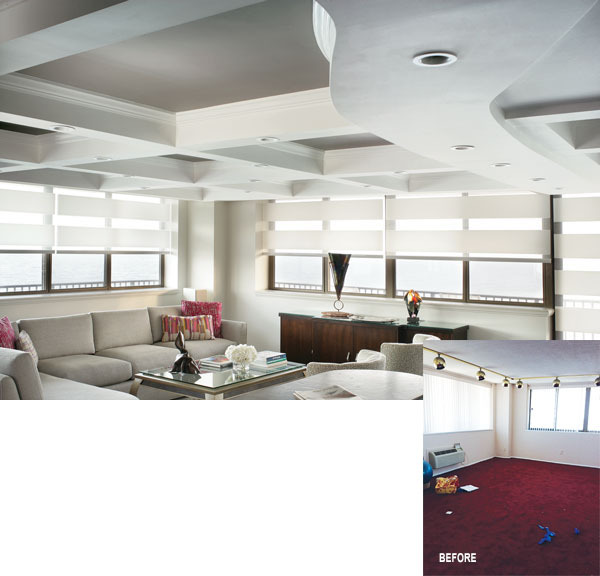 BEFORE: During the condo’s transformation, dated windows, window treatments, carpet and lighting bit the dust. By floating the sofa, Rich hid the wall-mounted heating and cooling unit. A red-lacquered desk (far right) fits around and camouflages a heating and air-conditioning unit in the wife’s office, which doubles as a guest room. The ebony cabinet next to the queen sleeper sofa provides storage space for guests. 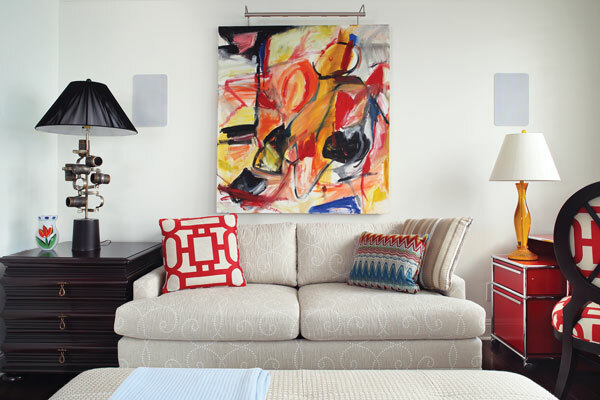 Sliding red barn doors allow the couple to extend the sofa’s bed without in-swinging doors bumping it. The designer reused the couple’s lamps (one made of plumbing parts) and television cabinet. BEFORE: The designer removed a closet (background, left) to squeeze out a few more square feet for the wife’s office/guest room. The blue tape on the floor indicates where the wall with the barn doors was to be constructed. The “pantry” to the right of the refrigerator houses a full-size stacked washer and dryer; the counter (foreground) provides an ideal surface for folding. BEFORE: The original 1970s kitchen was small and abutted the laundry room, which ate up more space than necessary. The designer merged the spaces during the nearly year-long renovation. 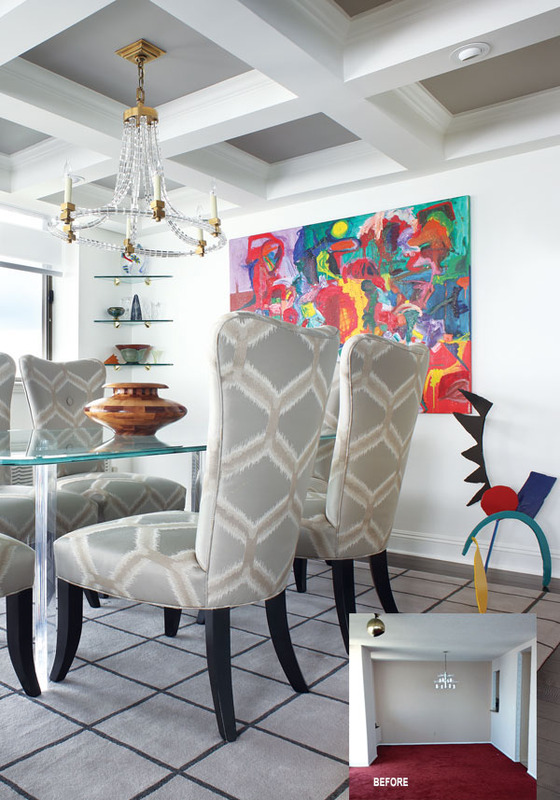 The designer reused the couple’s dining room furniture from a smaller condo they had owned in the same building. She reupholstered the chairs and put a clear base under the tabletop to preserve a sense of openness. Coordinated rugs anchor the dining and living rooms. BEFORE: The tired dining room was ready for a new chandelier, recessed lighting and modern furnishings. In the den/guest room, ottomans on casters easily roll out of the way so the owners can make up the queen sleeper sofa for guests. To create storage for books and collectibles without sacrificing floor space, Rich designed the shelf above the closet. 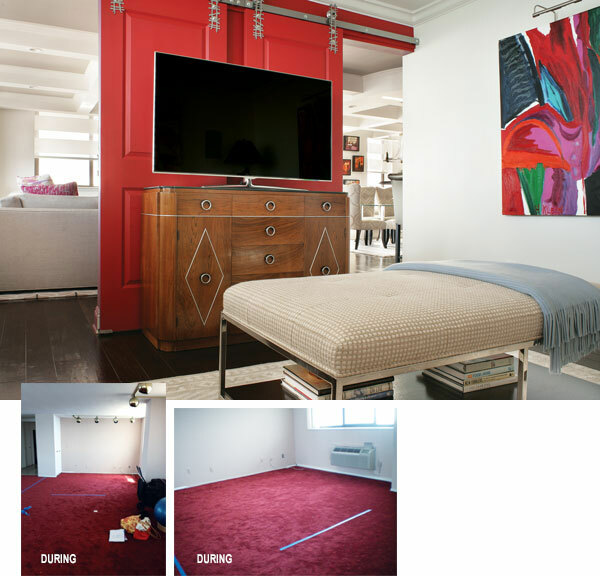 She also remarks how well the rug coordinates with the wife’s big painting (left). The wife loves the orange end table. A light bridge over the sink, countertop and mirror makes grooming a breeze in the master bathroom. The marble mosaic strip under the mirror complements the tile mosaic on the floor but isn’t the same pattern. 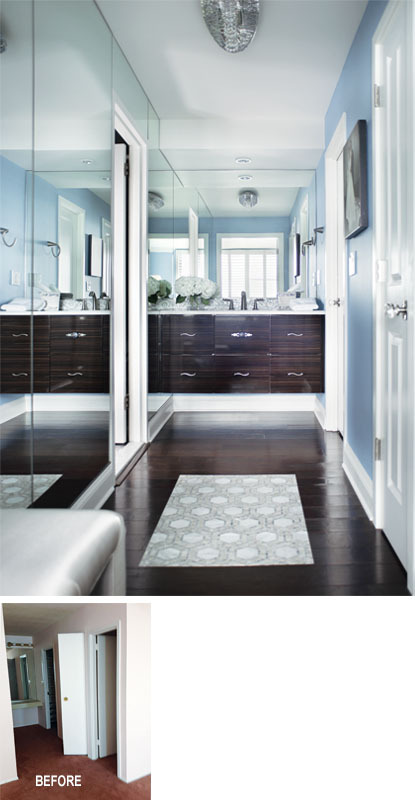 BEFORE: Sheila Rich faced storage and style challenges in updating the master bathroom. 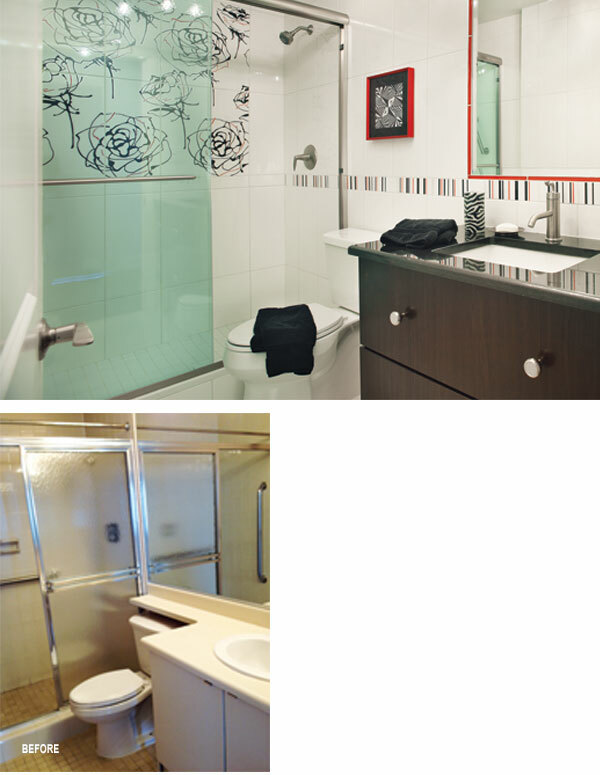 The guest bathroom is equally elegant and edgy but different from the master bathroom,” Rich says. All tiles, including the roses and stripey border, are from the same collection; the floral design is baked on the porcelain. 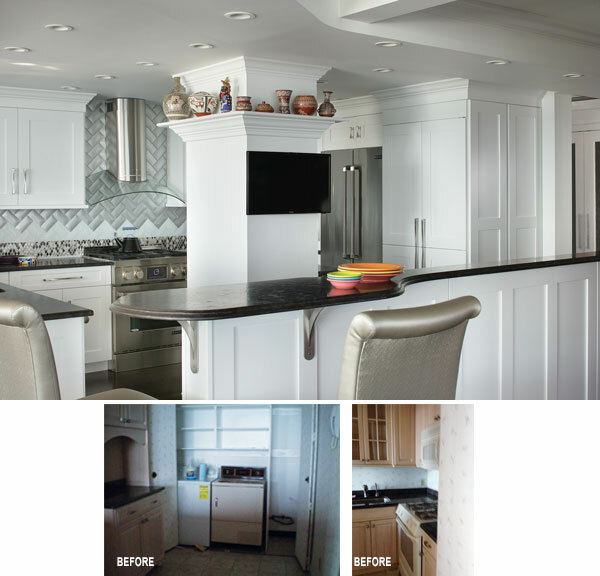 BEFORE: The designer and her clients said bye-bye to the dated glass doors and laminate countertop. The designer added an Art Deco mirror above the couple’s existing chest of drawers in the master bedroom alcove (they brought the lamps with them too); in front of it is a leopard-pattern rug. Frosted-glass doors lead into the dressing area. The dressing room and master bathroom are outfitted with the same cabinet to create a sense of continuity; they’re both floated, which helps the spaces feel open. A marble tile “rug” (the same marble on the master bathroom floor) is set into the engineered hardwood. BEFORE: The dressing area went from glum to glam with the addition of modern lighting, mirrors and panel doors. A Monmouth Beach condo perks up the wow factor as it picks up a third bedroom. In its “before” condition, calling this 1,700-square-foot two-bedroom condo dated would have been a kindness. Its 1970s minuses were all too evident, including a closed-in layout, passé track lighting, vertical blinds, dreary wallpaper, old windows and insufficient wiring for millennial amenities. But the current homeowners bought the Monmouth Beach, New Jersey condo because of two crucial pluses: breathtaking views of the Atlantic Ocean and enough space in the hands of a resourceful interior designer to better accommodate guests. Rich’s clients, who found her online when they searched for a designer in their town, presented her with their wish list: an open floor plan, a showcase for large abstract canvases painted by the wife, a third bedroom, motorized window treatments and surround-sound audio. And, of course, updates everywhere. Although husband and wife both contributed to the wish list, Rich worked mainly with the lady of the house. “He trusted his wife, and he trusted us together,” Rich says. The empty-nest couple lived in their smaller two-bedroom condo in the same building during the nearly year-long project that prescribed new plumbing and wiring within the condo’s walls, merging the old laundry room and kitchen into a larger kitchen, removing a closet, replacing the windows and carving out space for her office―which doubles as a third bedroom―out of the living room. The designer, whose firm is Sheila Rich Interiors LLC in Monmouth Beach, NJ, says she started with a concept on paper that included furniture sizes. “I told her, ‘This is your sofa; these are your chairs. I let the client select and lead the way on choices. She shopped with me in the showrooms, and together we came up with the furnishings,” which include distinctive rugs that help define the areas within the open-concept living space. The project had four major challenges, which Rich dispatched with flair. 1. A huge support column that runs the full height of the building: This structure, which Rich refers to as “the elephant in the room,” initially had been part of the separation between the kitchen and laundry room. 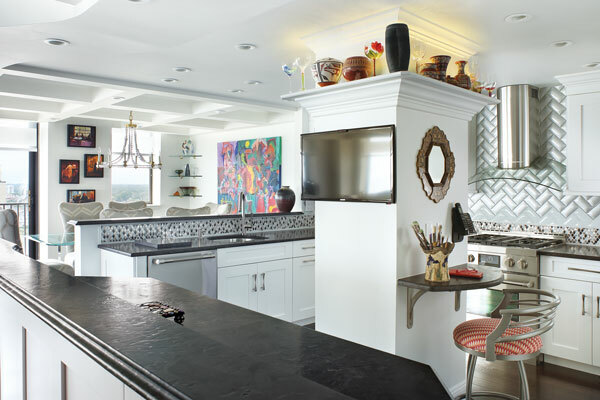 She let the kitchen flow into what originally was the laundry room and made the column an eye-catching feature with a high ledge for displaying some of the homeowners’ collectibles. A floating desk on the back of the column carves out a bit more function. “We made lemonade out of it,” Rich says. She relocated the laundry to a “pantry” cabinet (beside the refrigerator); it houses a full-size stacked washer and dryer. 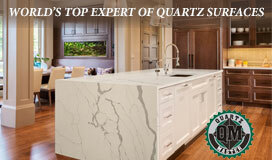 Nearby, a curvy granite breakfast bar can be used as a surface for folding. 2. Eight-foot concrete ceilings: These prevented conventional installation of recessed lighting, so Rich designed a coffered ceiling to hold recessed fixtures and conceal wiring for the audio system that flows into every room. 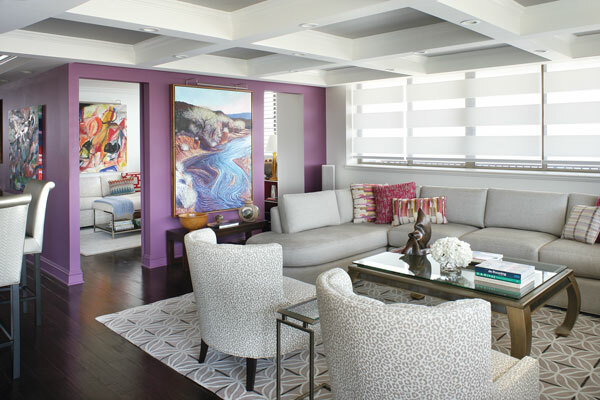 The coffered ceiling gives the room “a real architectural feel, a little drama. Dark paint inside the molding makes you look up,” she says. Another issue: The 6-plus-inch-tall base and crown moldings would visually shorten the walls if painted a different color. So she used one color on each wall to maintain the sense of height as much as possible. 3. Wall-hung heating and air-conditioning units, required by condo rules: In the living room, the designer hid the unit by floating the sofa. In the wife’s office, Rich designed a red-lacquered metal-and-chrome desk that fits around the intrusive climate-control box. 4. Small second and third bedrooms: Rich designed sliding barn doors that provide two doorways into the wife’s office so the queen-size sleeper sofa can be opened without being bumped by in-swinging doors. An ebony side table provides storage that overnight guests can use. The third bedroom, which the couple refer to as the den/guest room, also has a queen sleeper sofa. Rich designed a display shelf above the closet to house the couple’s books and collectibles without taking up a speck of floor space. The designer says the revitalized condo is all about enjoying the Jersey shore, family and friends in comfort and with a flourish. 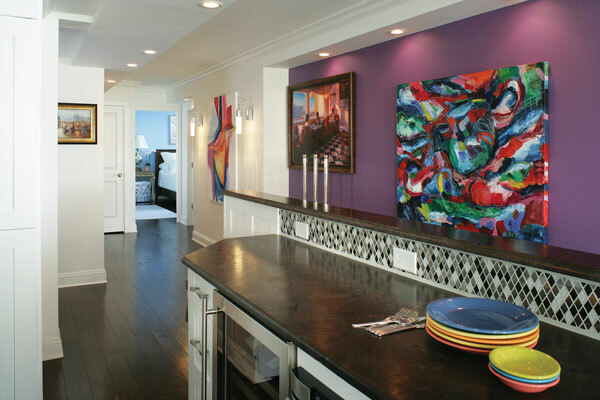 Mary Vinnedge admires the interior-design ingenuity of this condominium as well as the bold decorating. Overall: interior design, Sheila Rich Interiors in Monmouth Beach; contractor, O.C.C. and Associates in Lincroft. Living Room: cocktail table and chairs, Schwartz Design Show­­room in Metuchen; Allure motorized window shades, CMI Inc. in Springfield; area rug, J. Herbro in Fairfield; fabrics, Major Mills in Clark. Kitchen: backsplash tile, Ideal Tile in Freehold; countertops, OHM International in Monroe Township with fabrication by Ideal Tile Fabrications in Farmingdale; chair, J&H Dinettes in Freehold; cabinet hardware, Creative Space in Shrewsbury; custom millwork and carpentry, RLK Home Improvements in Barnegat. Dining Room: fabric and chandelier, Schwartz Design Showroom; area rug, J. Herbro. Wife’s Office/Guest Room: sleeper sofa and ottoman, Vanguard Furniture in Conover, North Carolina; red-and-chrome desk, USM Modular Furniture in New York City; end table, Lexington in Thomasville, North Carolina; fabric for pillows and upholstery, Major Mills; chair, Fairfield Chair Co. in Lenoir, North Carolina; custom throw pillows, J&H Dinettes. Den/Guest Room: sleeper sofa, Vanguard; rug, J. Herbro; fabrics, Major Mills; custom ottomans and pillows, J&H Dinettes; orange end table, Schwartz Design Showroom; custom millwork and carpentry, RLK Home Improvement. Hallway: sconces, Capitol Lighting in Eatontown. Bathrooms: tile, Ideal Tile; plumbing fixtures, Ferguson Bath, Kitchen & Lighting Gallery in Red Bank and Creative Space; countertops, OHM International with fabrication by Ideal Tile Fabrications. Master bedroom: rug, J. Herbro; door hardware, Creative Space.